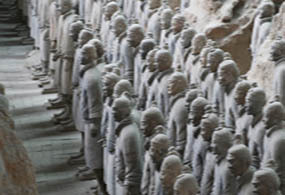 This 11 day “Discovering China” package starts in Beijing and travels to X’ian the home on the famous Terracotta Warriors. The collection of over 6000 life size statures built over 2000 years ago . Then travel to Chengdu to see the Giant Pandas breeding research facility and lastly you travel to Guilin . The other highlights include seeing the Great Wall of China , the Forbidden City , and the Longsheng rice terraces. The price in September or October is £2599 pp including flights .